Remember NickerMakers? Well, believe it or not, there’s a dumber name than that. 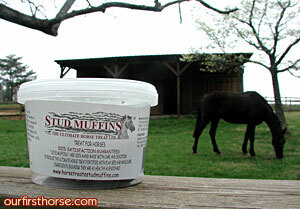 I just got Valentine some horse treats called Stud Muffins. No joke. He LOVES them! They smell pretty good to me, but they look an awful lot like what I shovel out of his stall every morning, so I’m not tempted to try them. Yet. In case you didn’t know, horses love to eat. It’s what they do all day. In fact, they are made that way – they are so big, and their diet is so low in calories, that they pretty much need to eat constantly. Valentine is no exception. For his regular diet, his favorite thing is oats, followed by fresh grass, followed by hay (since the grass started growing again, he’s not too keen on the hay). His favorite treats are apples, carrots, NickerMakers and Stud Muffins. My next experiment, treat-wise, will be homemade horse treats. I’m not making that up. I’ll post recipes here after the results are in.